I have ALWAYS loved to create! Ever since I was little I had to have my coloring book and the full box of 64 crayons with me, or whatever crafty thing I was into at the time. My Grannie is an artist, and from a young age I was also so inspired by her ability to paint and to create beauty on what was previously a blank canvas... so I began painting when I was very little, and have always picked up a paintbrush at least a few times a year, just for personal projects or the occasional Christmas gift. I’ve also been very blessed to have always been surrounded by artists of many genres, whether it be painting, dancers, musicians, photographers, etc, and have been inspired by so many people by watching them create with such excellence! What influences you? / where do you get your inspiration? I am greatly inspired by nature, specifically florals and greenery. I have always been drawn to the beauty of flowers, and am amazed that something so seemingly simple can bring so much joy. They can be symbols of gratefulness, celebration, joy, apology, sorrow, renewal, hope... the list goes on. I am also deeply inspired by neutral and minimal interiors, especially homes that maintain warmth and comfort despite their simplicity. I know that I am drawn to pieces that radiate peacefulness, and I hope to translate that into my own work as well. How do you balance your personal time + work? / how do you create separation? Most of the time it’s the day to day swing of things that can be challenging for me. I am still managing my fine art wedding photography business, so balancing two jobs plus keeping a healthy personal life can sometimes feel overwhelming. With my studio literally in my house, separating work and personal life sometimes means I have to be diligent about either being purposefully in the studio, or closing the doors and staying out. What keeps you motivated?/ why do you love doing this? 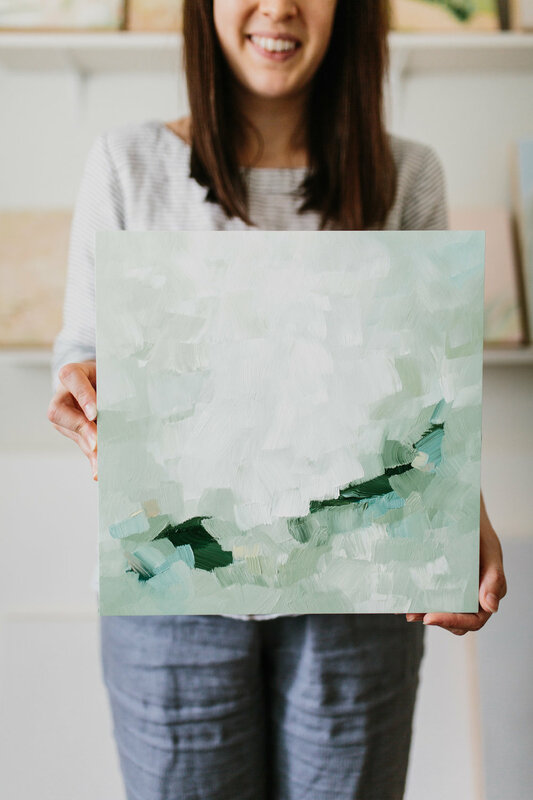 One of my motivations is to make others feel the way I do when taking in a joyful, peaceful piece of artwork - calm, centered, and thoughtful. There’s a bit of hospitality in creating a painting, knowing (hoping!) it’s going to end up in someone’s home, and hospitality has always felt like a huge calling for my life. To know that my work can impact how anyone feels walking into that space is such a simultaneously thrilling and terrifying thought, but I love it! Where do you see yourself in 2-5 years? / what’s next for your brand? Oh goodness, I just feel so grateful to still be in my first year! I do have hopes of doing an art show or two in TX at some point over the next year. My husband, Bryan, and I have also been saving and planning on renovating our detached garage into a full art studio! (All white and big beautiful windows, yes please!) As crazy as it sounds I’m already feeling growing pains and needing more storage space within my home studio- but I’m grateful for the growth pains I think other than that, I just want to keep creating and playing and figuring out what my own style is, and how best to harness and develop that!